The Most Effective Cowboy Pain Relief for Back Muscles Available! 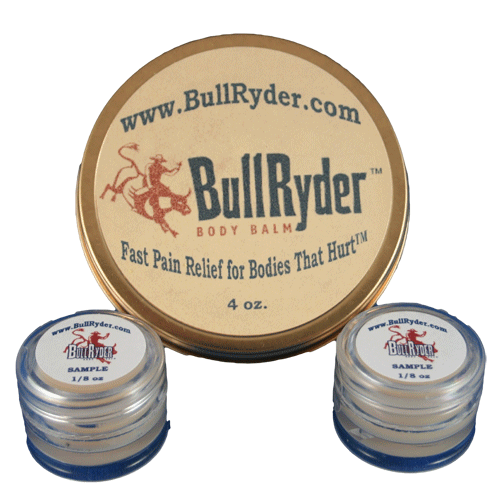 BullRyder Body Balm™ is cowboy pain relief – it works hard just like you! When you’ve got neck and knee pain or lower back pain or joint pain from riding that bull or from your hard work, you want a strong pain relief cream (not a wimpy pain spray) that works as hard as you – strong stuff just like you. Not JUST effective lower back pain relief, but also great for muscle pain, arthritis relief, fibromyalgia pain, and muscle joint pain relief. This hardworking pain relief salve is naturally strong to provide muscle pain relief and back pain relief for hardworking bodies. This exclusive BullRyder pain relief formula offer is available only online. Bullryder™ is not sold on Wall Street, and is not made for “suits”. Get much needed pain relief, including general back pain relief, muscle relief and joint pain relief as well as relief for achy muscle pain in just 10 Minutes – Guaranteed! BullRyder™ is not just cowboy pain relief. BullRyder™ is designed for use by everyone from bull riders to cowboys to truck drivers to athletes. It’s formulated to effectively provide pain relief from overused muscles and strained muscles as well as providing joint pain relief. Our company is so sure that you will find BullRyder™ effective for relief of your muscle pain and back pain that we offer you a 110% guarantee that BullRyder™ will give you muscle and back pain relief (cowboy pain relief) within 10 minutes of the first application*. Not intended as a substitute for medical treatment. Why should you try BullRyder™ for your cowboy pain relief? BullRyder™ is the only topical body balm for back pain relief and muscle pain relief that offers a 110% money-back guarantee. Just 1 of the 11 active components of BullRyder™ alone has been shown by scientific research to decrease perceived muscle pain by 35%. BullRyder™ is guaranteed to produce results in 10 minutes or less. BullRyder™ is formulated for use by professional athletes as well as “regular” folks who simply over do it and for older folks who need muscle and joint pain relief. Great Value: Over 20 applications in each container (6″ x 6″ area). Does BullRyder™ Really Work? You Betcha! 110% Guaranteed. Try BullRyder™ Risk-Free for 30 days. If it doesn’t work just like we said, return it for a 110% refund. *110% offer limited to one item per customer on first order only. Note: BullRyder Body Balm™ is intended for use by people experiencing muscle and/or joint pain brought on by over-exertion, muscle strain or by simple aging. It is not intended as a substitute for proper medical treatment in cases of pain caused by structural defects or injuries of the spine or skeleton or other medical illnesses or conditions that should be diagnosed and treated by a medical professional. © Copyright 2016 EcomGreen LLC. All Right Reserved.